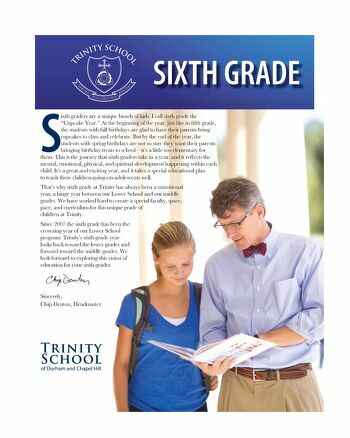 Trinity School’s sixth grade is unique—a program designed specifically to support and challenge sixth graders as they adjust to the initial stages of adolescence. Sixth grade functions as a hinge, connecting Lower School to Middle School to ensure a smooth transition, and it features a special space, pace, and curriculum. Sixth Grade is the first year students at Trinity are able to participate in organized athletic competition. Guided by the Trinity School Middle School athletics program, three full seasons of interscholastic sports is offered for students in grades 6–8. The program focuses on development of character (faith), love of the game, and developing fundamental skills. The Middle School sports model puts emphasis on skill development for the first portion of the season and teams selection is based on training sessions and development of athletic goals.